St. Francis is best-known for expressing his love of God and Creation in his kind and compassionate relationships with animals of all kinds. Francis preached to birds, counseled wolves and townspeople on how best to get along, kissed lepers and passionately defended this world's "little-ist and least." Once a year, we honor him by honoring the creatures he loved so deeply. There is no cost. Any contributions or offerings will go to the wonderful SECAUCUS ANIMAL SHELTER, whose Director, CHRISTINE CONTE, will be us for this event. Come meet her and, perhaps, some of her charges, and join in treats and refreshments for all - people and animals - in our lovely back garden. 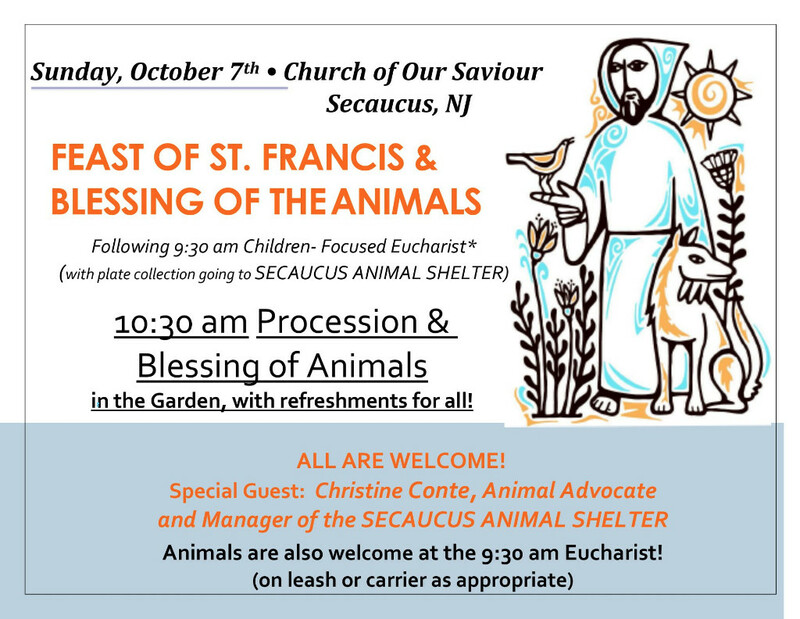 Note that animals are also welcome to attend the children-friendly Eucharist (for short attention spans) at 9:30 am in the church. As always, children are especially welcome at this event and we are happy to bless stuffed animals! So, please come - Have fun, do good, and meet your neighbors all on the same day. * For as long as they last.